How New York's gambles are paying off. Plus, "Chandler Bang," the rise of the PUJIT, and the ugliest court in the NBA. Playing unconventionally in the NBA amounts to a continuous series of bets. For most teams, going small, with a wing player sliding to power forward, has goosed scoring while compromising defense and rebounding to an unsustainable degree — at least for risk-averse coaches. A reminder: The Knicks offense died last season when Anthony, Stoudemire, and Tyson Chandler played together, scoring at a bottom-five overall rate. A healthy Chandler has emerged as one of the NBA’s five best pick-and-roll big men, outdoing Stoudemire at Stoudemire’s best skill. Anthony is dramatically more effective working the post and driving to the hoop, tougher tasks with two traditional big men around the paint. That left Stoudemire aimlessly looping around the perimeter for elbow jumpers he made a third of the time, awkwardly picking his spots to attack, and hurting the team on the other end with consistently bad defense. Woodson would argue that the three might mesh more easily this season, with a real training camp and practice. That’s probably right; the team should do better this season with all three on the court, an alignment New York will have to use at times regardless of Stoudemire’s status. But there’s almost no chance the Knicks with those three on the floor will outperform what the Knicks have done with Anthony at power forward. Those lineups are blitzing the league, with the most frequently used outscoring opponents by 20 or 30 points per 100 possessions — basically impossible numbers. Unless something changes, the Knicks need to maximize their time with Melo at power forward and fit everything else around that — a rotation adjustment that isn’t all that hard, as New York’s weekend games showed. Bet No. 1: The Knicks can survive defensively with Anthony guarding power forwards, even if teams attack him. Check. And this is a team effort. Opponents are indeed going at Melo in the post, but they’re mostly shooting themselves in the foot; Melo’s head-to-head assignments are shooting just 7-of-20 on post-up shots and turning the ball over on nearly 30 percent of those plays — a staggering number, per Synergy Sports. The same thing happened last season, when guys posting up Melo shot just 11-of-37 and coughed it up on 26 percent of the possessions they finished. It’s almost as if the Knicks are entrapping opponents by holding the “weaker” Melo as bait — a theory at which Woodson scoffs. “I don’t really worry too much about what the other team is doing,” he says. The one bugaboo has been foul trouble; Melo compensates for his size disadvantage with some early bumping and reaching, and sometimes that’s going to draw whistles. Melo had to sit in the third quarter against Memphis on Friday and Indiana on Sunday, and the Knicks’ offense collapsed without him. Woodson has been playing Chandler and Rasheed Wallace together for some of that non-Melo time, and the open space just vanishes with those two bigs sharing the floor. Raymond Felton is thriving this season in part because the court is wide open for him to meander on the pick-and-roll with Melo at power forward; all those lanes are closed in the two-center lineups. This has often left the Knicks overly dependent on J.R. Smith isolations when Melo sits. New York is scoring 112.3 points per 100 possessions with Melo on the floor and just 101.4 when he sits, per NBA.com. The first number would lead the league by a mile; the second number is about league average. This is the obvious place for Stoudemire, the guy who can prop up the offense for 12-15 minutes a night when Melo sits. New York’s pile of aging, defense-first centers would allow Stoudemire to fill this role without also playing center, which is untenable defensively. It’s also possible to slot Stoudemire a few non-Chandler minutes per night with Anthony at small forward and Rasheed Wallace acting as a spot-up center. That’s not ideal, but it can work in small doses. Bet No. 2: Anthony will destroy power forwards who guard him. This is not an isolated incident. Anthony has been killing power forwards by setting up at the left elbow and blowing by them. Bet No. 3: Anthony will bully small forwards instead of settling for jumpers. Anthony’s assist numbers are actually at a career low, but I’d wager good money the fancy data-tracking camera system to which the Knicks subscribe reveals he’s posting a career-best rate of hockey assists.1 Sliding Anthony to power forward has helped him find a sort of functional selfishness — a way to dominate the ball without hurting his team. It has encouraged his best offensive tendencies and pushed him toward minimizing the worst. Bet No. 4: New York will punish teams who play two traditional big men and hide a power forward on Ronnie Brewer or Jason Kidd. Look: The Knicks aren’t going to outperform the ’86 Celtics with Melo at power forward. He’ll go through fits of taking too many contested mid-range jumpers. He’s shaky-to-bad at the other duties that come with big-man defense — rotating across the lane to protect the rim, defending pick-and-rolls in space, etc. Smith is going to start missing more 3s and crazy one-on-one fadeaways. Brewer’s jumper will falter, just as it did last season after a hot start in Chicago. The age of the roster is inescapable. As those variables flip to the negative side, the need for Stoudemire’s scoring will rise. But needing his scoring punch is different from needing to start him and play him heavy minutes with Anthony and Chandler. Bet No. 5: Defensive rebounding will hold up. TBD. The Knicks have been an average defensive rebounding team so far — somewhat discouraging — but they’ve protected the defensive glass better, at just about a top-10 rate, with Anthony on the floor. The two most commonly used “small” Melo lineups have rebounded on the defensive end at a top-five level. Still: It’s too early to check this one off. The Kings’ now-defunct starting lineup has scored 88.6 points per 100 possessions this season, per NBA.com. That kind of non-production is hard to manage; it’s worse than Charlotte’s offense last season, and worse than Washington’s this season. Keith Smart thankfully removed James Johnson, a usable defender who can’t shoot and nonetheless stops the ball at times to fire mid-range jumpers. Pairing Johnson with Tyreke Evans on the wing is NBA self-strangulation. Smart has replaced Johnson and Isaiah Thomas with John Salmons and Aaron Brooks. When John Salmons is the solution, you’re in trouble. It’s very early, but the lack of development here is alarming. The Cavs are wildly entertaining when Varejao and Kyrie Irving are working the pick-and-roll on the court and totally unwatchable when they sit. You can have your flopping jokes. I’ll take the guy giving me 14 points, 13 boards, three assists, and All-NBA level defense all over the floor every night. Varejao has assisted on 16 percent of Cleveland’s baskets while on the floor so far this season, a monster number for a center and nearly double his career high. What a fantastic player. 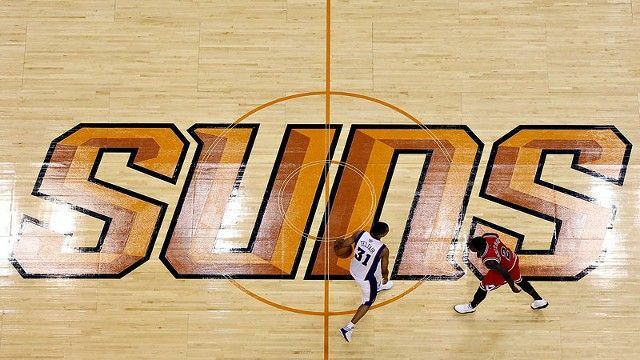 It’s Halloween year-round in Phoenix, as the Suns, for some reason, decided to eliminate their nice purple/blue shade in favor of this orange-and-black mess. It might be better than Andrea Bargnani’s, even though the jumper underlying the fake isn’t nearly as threatening. (Not that Bargnani’s jumper has been threatening during his disastrous start on both ends of the floor, and on the boards.) Kirilenko’s fake almost fools me through the television. Gasol is on the verge of becoming my favorite player in the league. He’s a smart and selfless player on both ends, always making the right pass on offense and sliding to the right spot on defense. I can’t think of a big man with whom I’d rather play. One nice wrinkle to his game: A straight up-and-down jump shot Gasol will take from the dotted line area in the lane, both on pick-and-rolls and when the ball finds him there during another nifty sequence of Memphis interior passes. Most players, big and small, take awkward shots from this 10-to-12-foot range — floaters, runners, hooks. Gasol just takes a faster flick-of-the-wrist version of the same jumper he can launch from 20 feet out. Fun to watch. PUJIT = Pull-up Jumper in Transition, and it’s time for Green to take his place on the All-PUJIT team with Jason Terry, Beno Udrih (our captain), Derek Fisher (inactive), Chauncey Billups, and other PUJIT experts. Green has an incredible way of catching the ball on a high-speed run, stopping on a dime, and rising for a jumper with perfect straight up-and-down form. There’s no leaning or drifting. It’s an uncanny product of repetition and hard work. I love Chandler Parsons. He’s a nice all-around player whom the Rockets smartly locked into a four-year contract that never exceeds $1 million in annual salary. It’s borderline unfair already. “Chandler Bang” is the combination nickname/exclamation Houston’s play-by-play announcer screams every time Parsons hits a 3. It might be a play on “bang” for a made shot and the “Chandler Bing” character from Friends, but it has become one of those irritating little announcing idiosyncrasies you hear across the League Pass spectrum. Give it to Scott Skiles: He’s a defense-first coach who has adapted to his personnel in Milwaukee by crafting an offense that is fast, effective, and a bit different from the NBA’s typical pick-and-roll attack. Milwaukee leverages the skills of Monta Ellis and Brandon Jennings by operating at high speed, with those two guards literally running circles around the half-court, zipping from the top of the 3-point arc, around the perimeter, down along the baseline, and up again to take a handoff on the opposite wing. It’s a side pick-and-roll on hyper speed, and intentional or not, it works as antidote to the Tom Thibodeau–style defenses that have swept the league over the last few years. Those defenses like to force all-side pick-and-rolls toward the baseline and further cut off the paint by sliding a third defender over from the weak side. Both of those tactics become more difficult when super-fast side-to-side motion and instant handoffs have the defense on skates. Give the Bucks a watch. These guys will fall out of the rotation once a few injured players (Gerald Wallace, Landry Fields, Alan Anderson) return, and it will come as a relief to their respective offenses. To say opposing defenses pretend as if these guys aren’t there is only a slight exaggeration. You can constantly find their defenders roaming around the paint, mucking up the primary action in hopes Brooklyn or Toronto must kick the ball to Childress and McGuire, respectively. McGuire is an especially good defender of every position from point guard to power forward, but it’s just hard to win playing a “hider” this extreme. Breaking news: Boston can’t defend without Kevin Garnett on the floor. They’ve allowed 94.6 points per 100 possessions when KG plays and 114.2 when he sits, per NBA.com. That’s about as large as the current gap between the league’s best and worst defenses. The Bass-Sullinger big-man combo has been especially flammable; Boston has allowed an unthinkable 139 points per 100 possessions in 41 minutes with those two on the floor. Over their last two games, Doc Rivers has essentially eliminated that two-man combination, using Chris Wilcox as a fourth big man to break them up. If that doesn’t hold, expect Boston to look aggressively in free agency (Kenyon Martin?) and the trade market for another big. As I’ve written before, New York is one of 13 teams that use the STATS LLC cameras, and one of 10 that used them last season. Data from 2011-12 showed that Anthony was remarkably efficient when he drove the ball to the rim, but that he didn’t do so nearly as often as most players in his efficiency ballpark.